Today I'm using up the last of my American Crafts Shoreline collection. 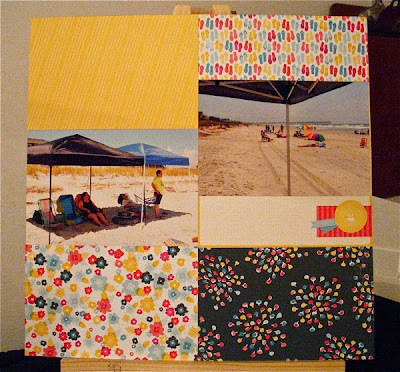 Two sheets of 12x12 patterned paper, some 6x6 paper, a few stickers and Elle's Studio summer themed tags are all that remain. I'm going to focus on that 6x6 paper pad to get my page going. Inspired by this Glitter Girl Adventure, I'm thinking about quadrants for a page base, with embellishment clusters on top. Here I am, making my own embellishments again. This cluster includes patterned paper that I die cut, stickers with one pop dotted, and a brad. 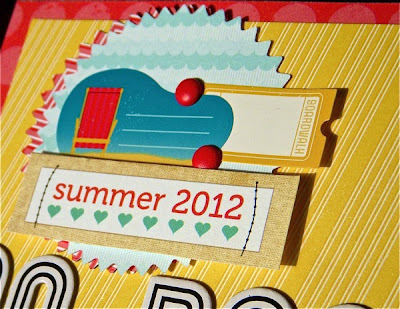 The cluster above my title in the largest, with two patterned paper die cuts, stickers, an Elle's Studio tag pop dotted and two brads. Here's the final cluster, and there you have it! I made a good dent in my stash with this layout and decided what was left could go in the donate pile. After all, the new goodies from CHA should start to roll in soon! Hope you have time for crafting this weekend. Are you making way for new supplies? 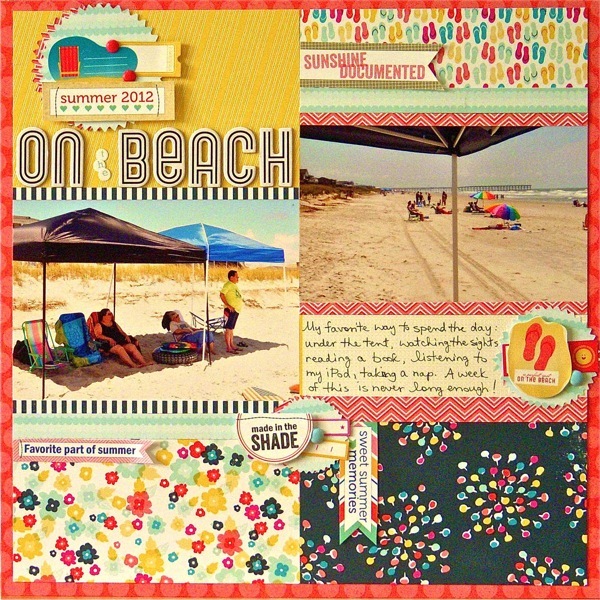 Love this colorful page - such fun little clusters!! 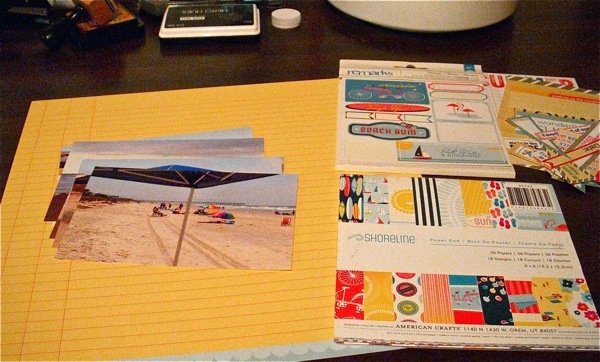 I have some 6 x 6 paper pads that I need to bust into too. I'll have to give this quandrant thing a try. No new CHA for me, though. 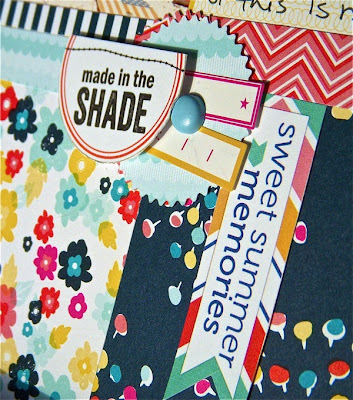 These 6x6 pads are perfect for the color blocking. I particularly like your embellishment groups that really support your theme. Great pinked circles. Your're right - a week is never long enough. 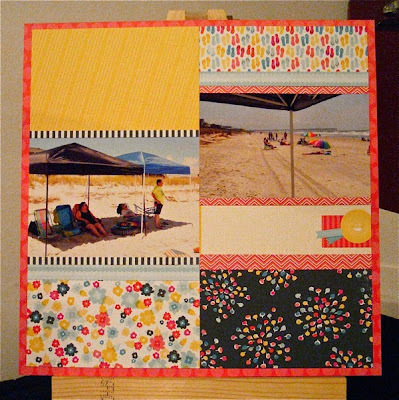 Love the block design, Sue! Great layout and I loved seeing the whole process! Beautiful job! Love what you did with the AC line! What a great layout. I love how you showed your page every step of the way. I'd say that using up your stash like this is like enjoying a cup of coffee to the last drop. :) I love the grid design and the overall sunny feel of the page. Good for you for using up your scraps! Another great, fun, colorful layout Sue! Catching up on my blogs, and this is just awesome! :) LOVE your clusters! I try to do this and mine never seems to look right. Thank you for such inspiration! 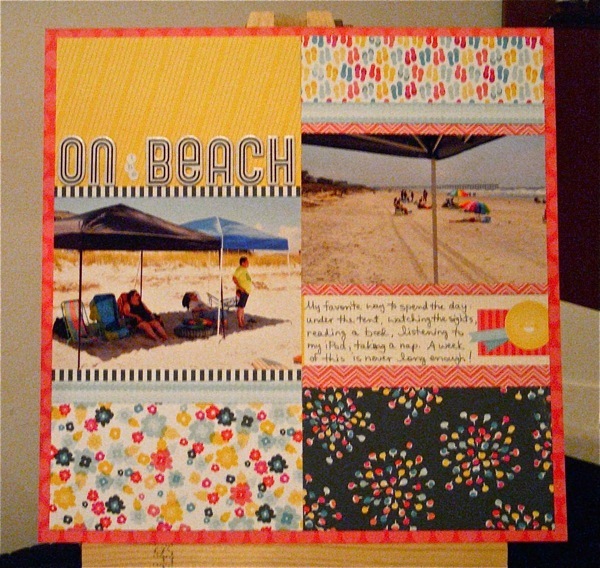 I' with Tanya...this layout is awesome...i love the process you showed us as you made your layout. 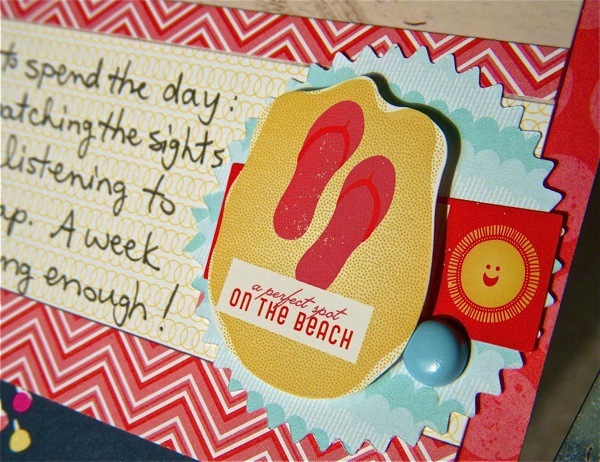 I always love the way you do your embellishments. The clusters of items are just perfect. Thanks for stopping by - I love reading your comments! Some links on my blog are affiliate links, meaning I receive a small commission for purchases made through them. They cost you nothing. I'm much obliged if you use my links, and if you don't, I'm just happy that you're here!